…just come early for parking and before the Parade starts. Remember they’ll be closing some of the streets. Let’s also help celebrate the awesome World Champions Little League Team. We are so proud. 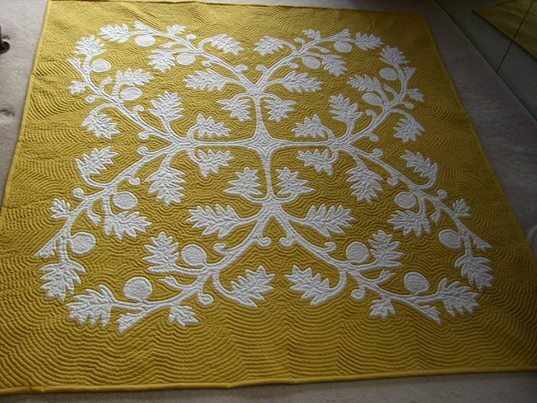 Now enjoy a re-post of this quilt from Eriko of Niigata. 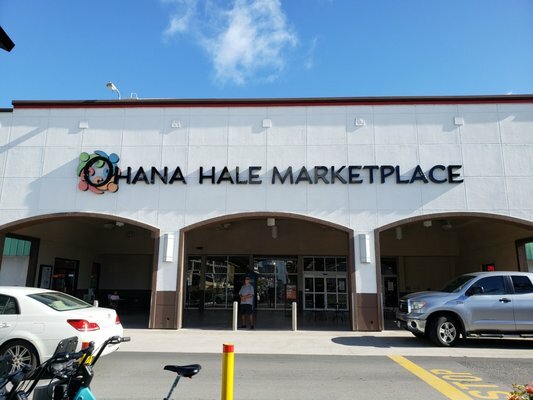 Due to Hurricane Lane the Iolani Palace will be closed until Monday. Everyone please stay safe. We’ll see all of you next week. 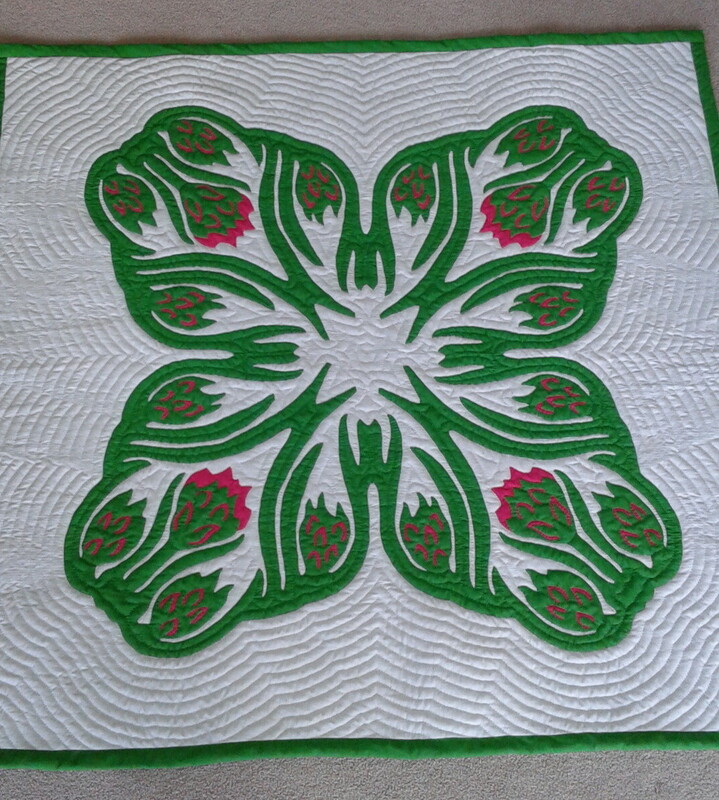 Enjoy a few pictures of our amazing quilters. 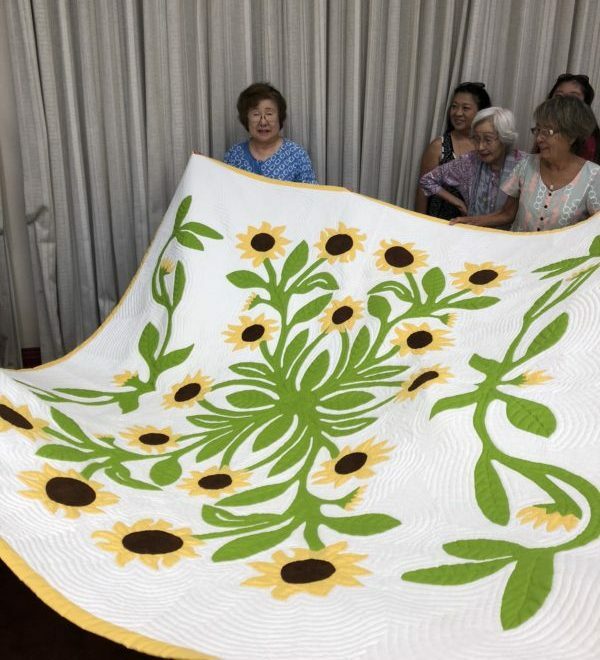 Yes, it’s the Sun Flower, Quilted by long time Honolulu resident Takako Jenkins and designed by John Serrao. Another keeper. High Above The Tree Lives the Octopus. Design First Comments Off on High Above The Tree Lives the Octopus. Sometimes thinking out of the box brings about some amazing designs. 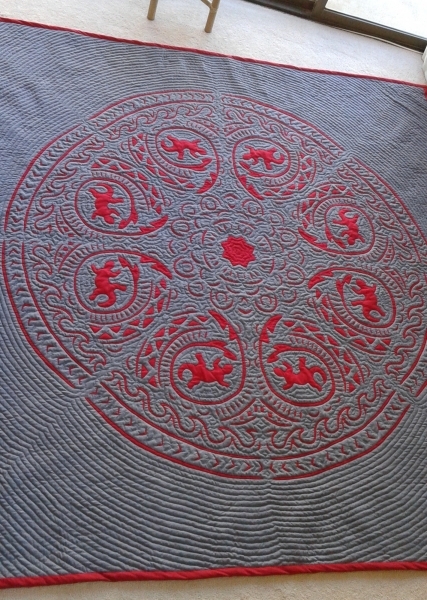 John’s designs usually range from the traditional to the whimsical. While I love anything he designs it’s the whimsical that makes me pause, admire and smile. 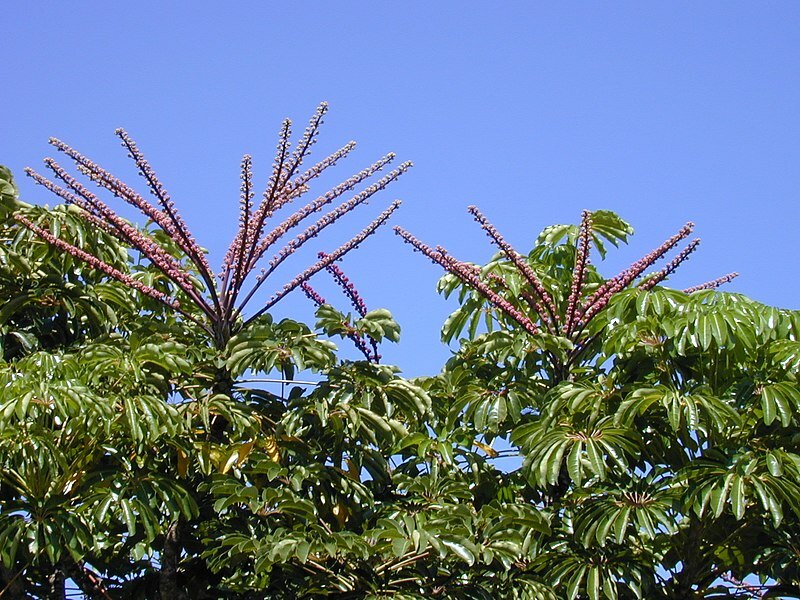 This amazing Octopus Tree design is given its unique characteristic by Pat Gorelangton. 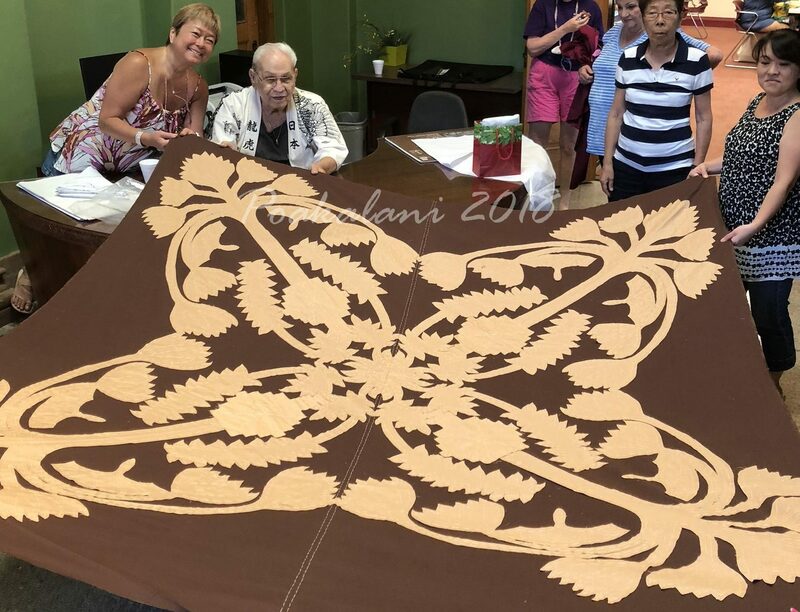 While John always makes the patterns it’s Pat who brings it to life. Congratulations Pat another Keeper. Our hearts are heavy. 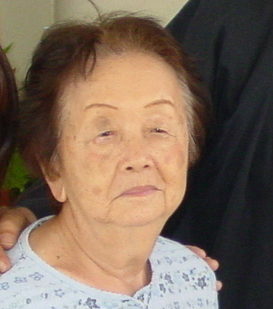 Next week we’re going to be saying “Until We Meet Again” to our dear friend June Miyasato. 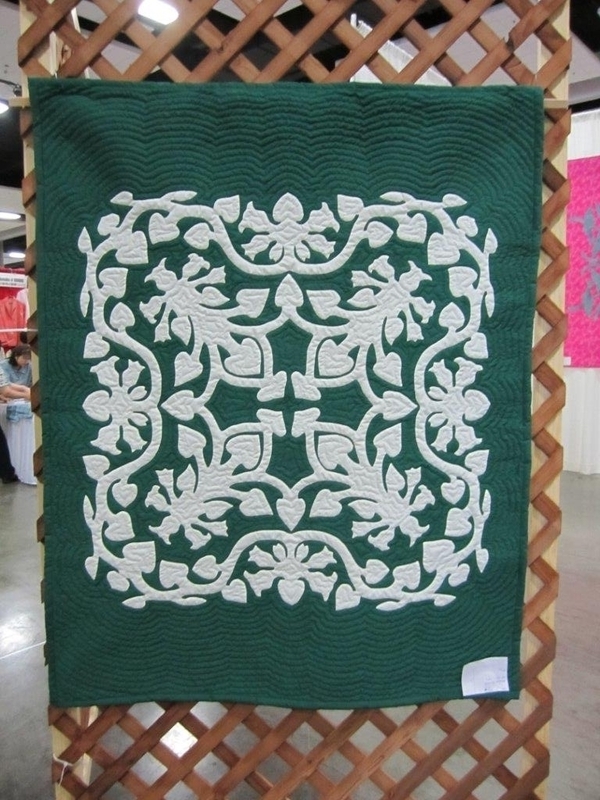 If you’ve ever taken a Poakalani Hawaiian Quilting Class then you know June. 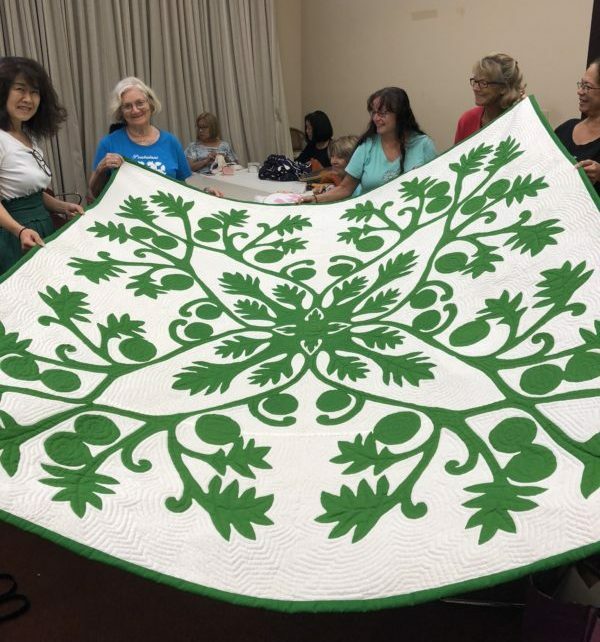 An integral part of our quilting classes June volunteered and taught along side of us at the Missions Houses Museum, Queen Emma Summer Palace, The Royal Hawaiian Shopping Center and for a little while at the Iolani Palace before retiring from quilting. 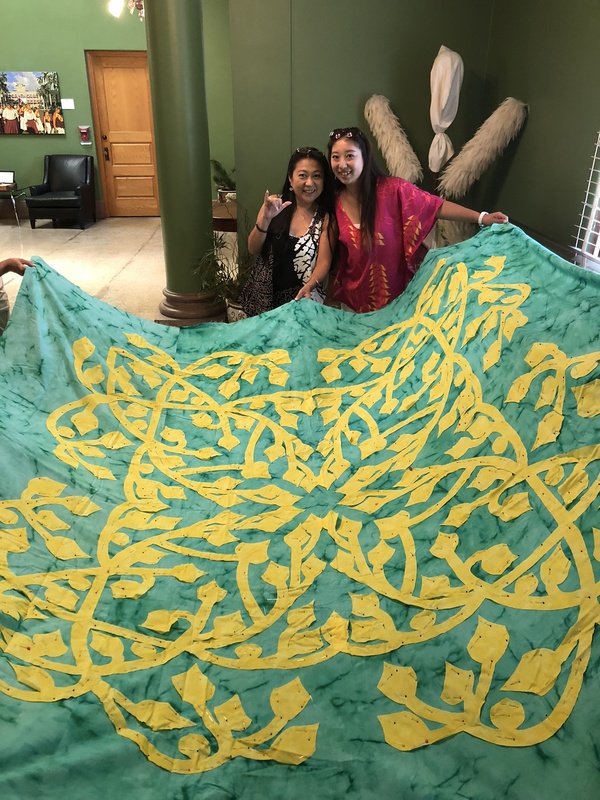 We would not have been able to teach as many people as we did without her help and because of her Hawaiian Quilting is alive and flourishing. 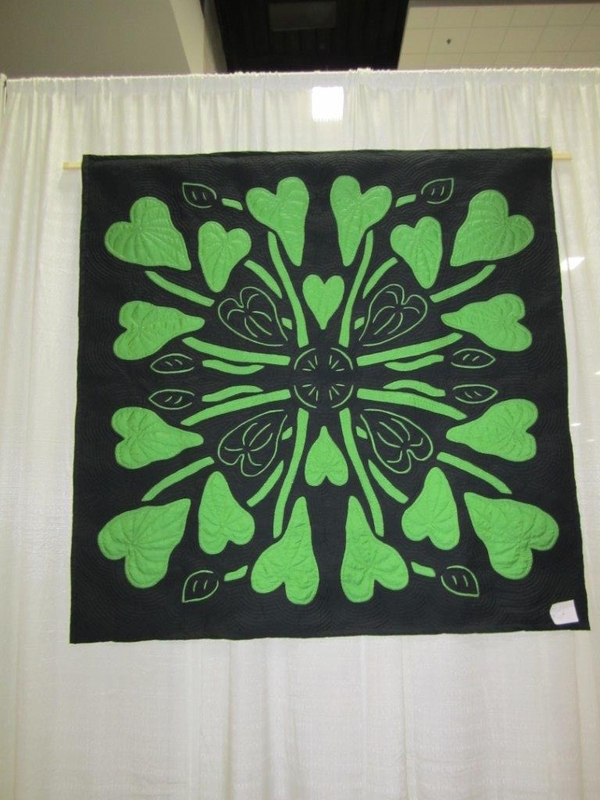 She was an amazing teacher, a dear friend to Poakalani, and part of not only our quilting family but our family. We quilted together, traveled together, and always shared a meal together after the classes. We will miss her. June was 92. 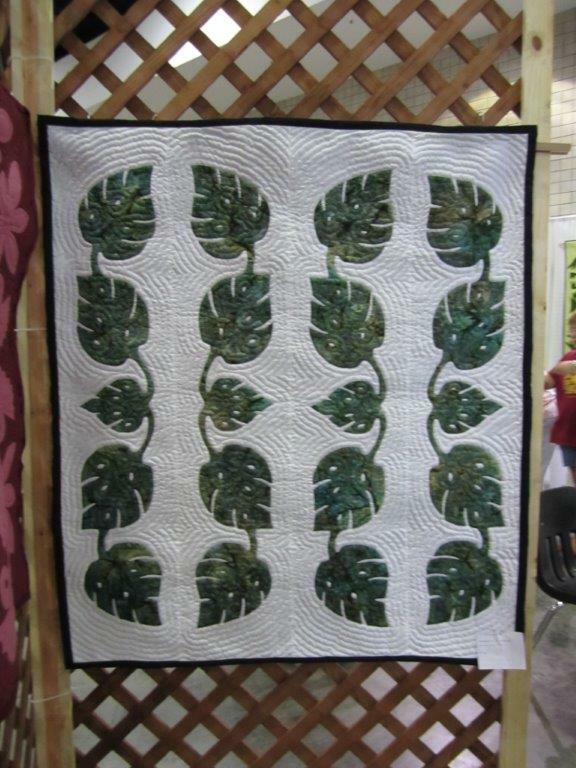 Congratulations Linda for finishing your amazing Ulu(Breadfruit) Quilt. It is truly beautiful a reflection of you. John loves it too and sends his aloha and mahalo for completing one of his designs. See all of you back on July 28. 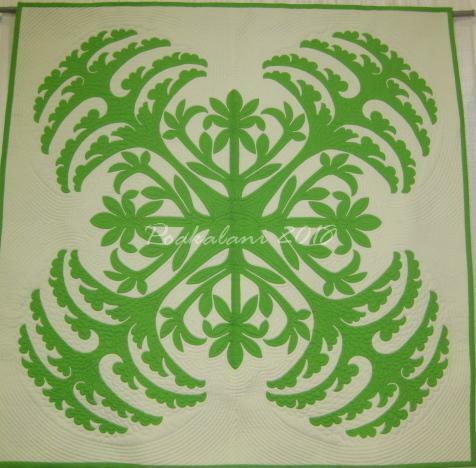 Until then enjoy this amazing Pineapple and Hibiscus applique quilt that was just cut and laid out for basting. 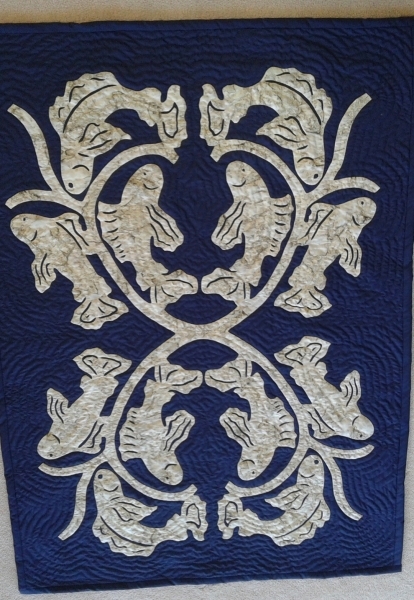 Once the applique is complete and all the raw edges are turned under the pattern will reveal its amazing design. Look at those colors. 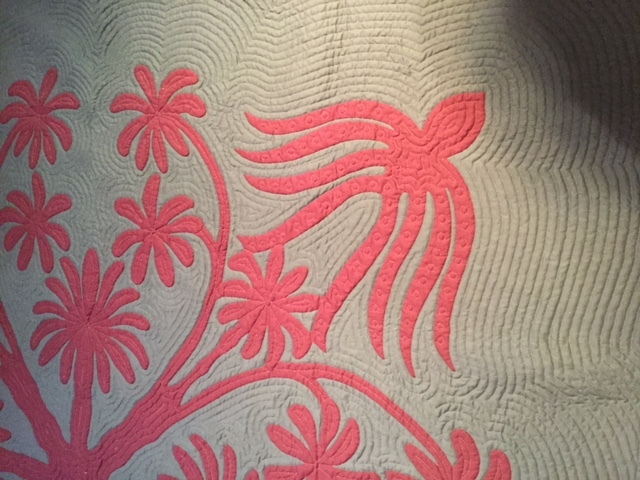 Another amazing design by John. Being away from classes two weeks in a row can be difficult so we’re happy that due to a cancellation we’re able to meet on July 28 for our regularly scheduled class. No class on July 21 but we’re back on July 28. No Class tomorrow July 8. Sorry for the last-minute changes please mark you calendar. Also Mark your calendars No Class July 21 & July 28. 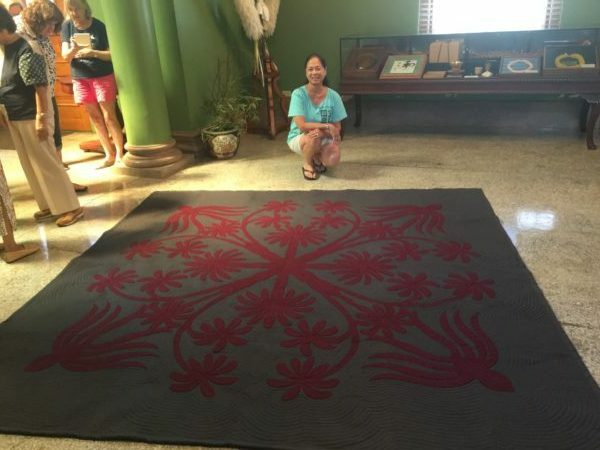 The Iolani Palace is very busy with summer activities. See you at class next week. 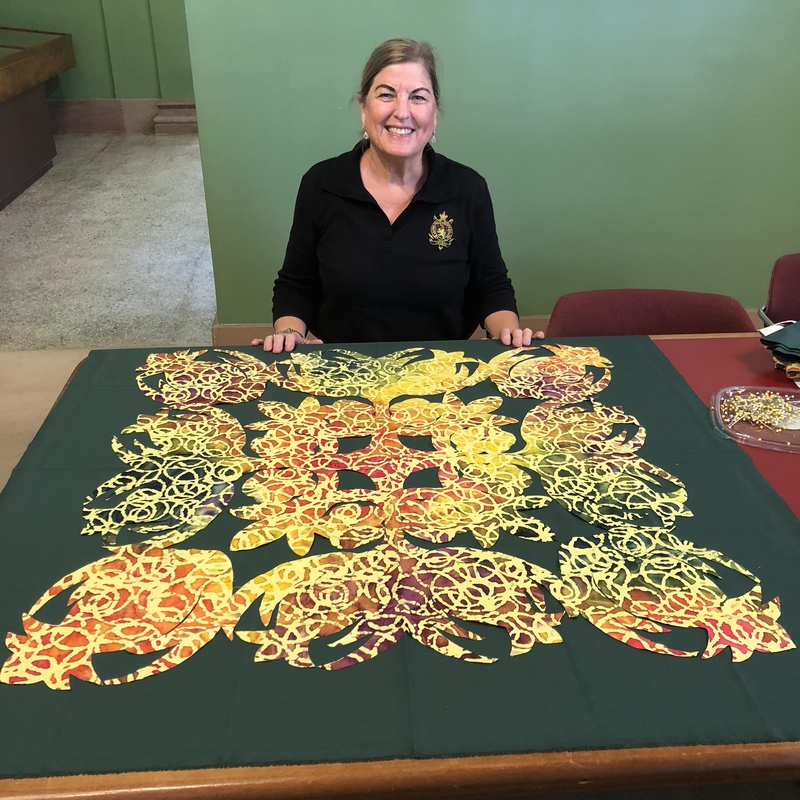 Loulu Palms can be found right outside the Kanaina Building where we quilt every Saturday at the Iolani Palace but not many people know that the Loulu Palms made beautiful and intricate Hawaiian fans. 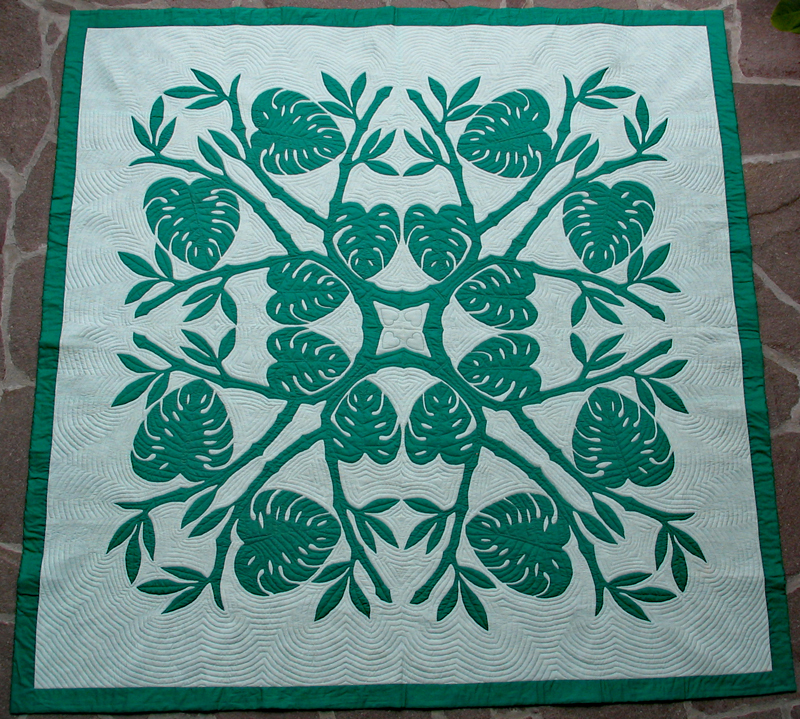 This quilt was designed for the Loulu Palm and Fans and also for Mie who will give this quilt its spirit. Designed by John Serrao. …It just makes me smile. 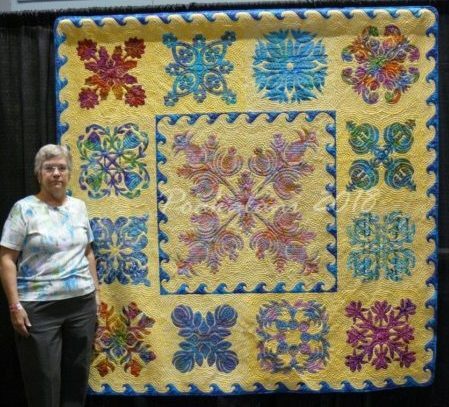 Congratulations Dawn, what an amazing quilt of colors. 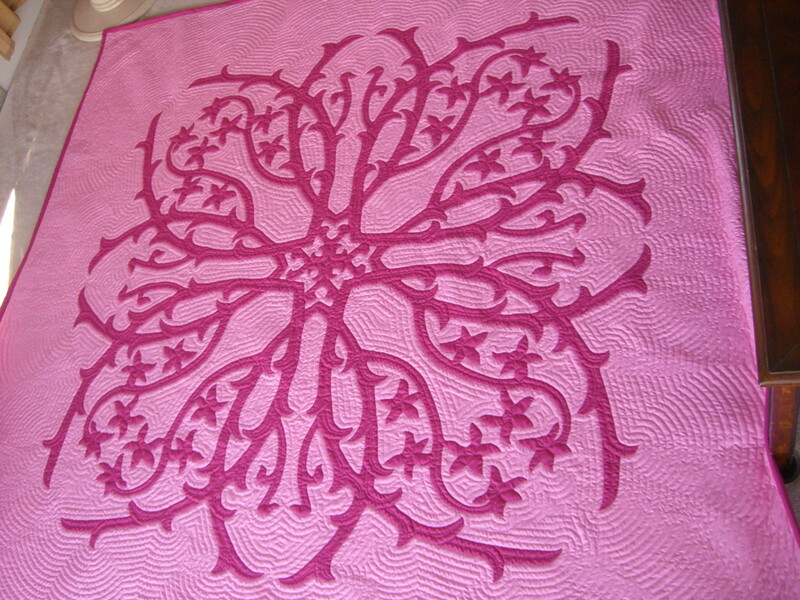 Quilt Designed by Dawn Cooper, Quilt Patterns Designed by John Serrao. 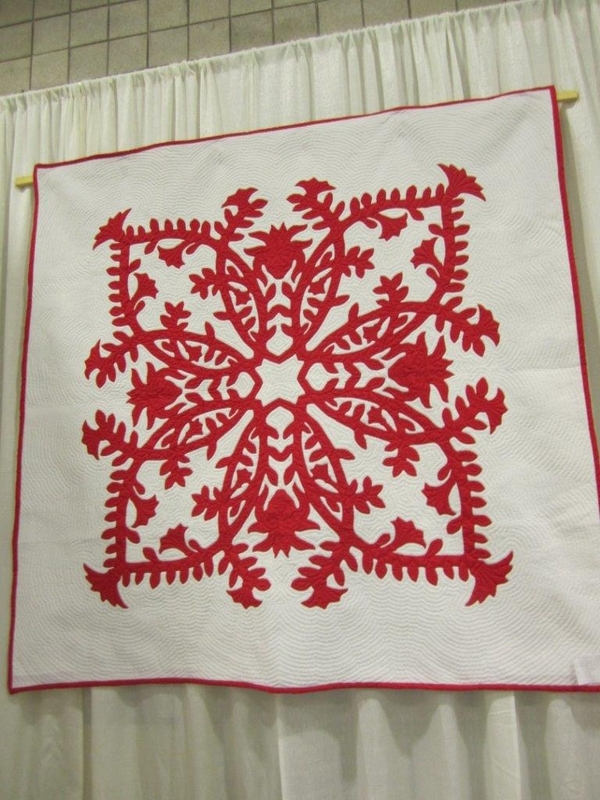 It has always been our belief that every quilt tells a story. 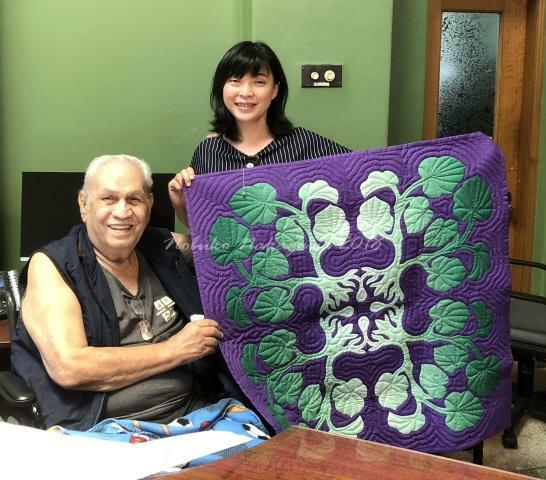 Stories starring not only the recipient of the quilt but also the quilter, and we must remember the designer with his magic pencils who creates the story on paper in the form of a Hawaiian Quilt Design. 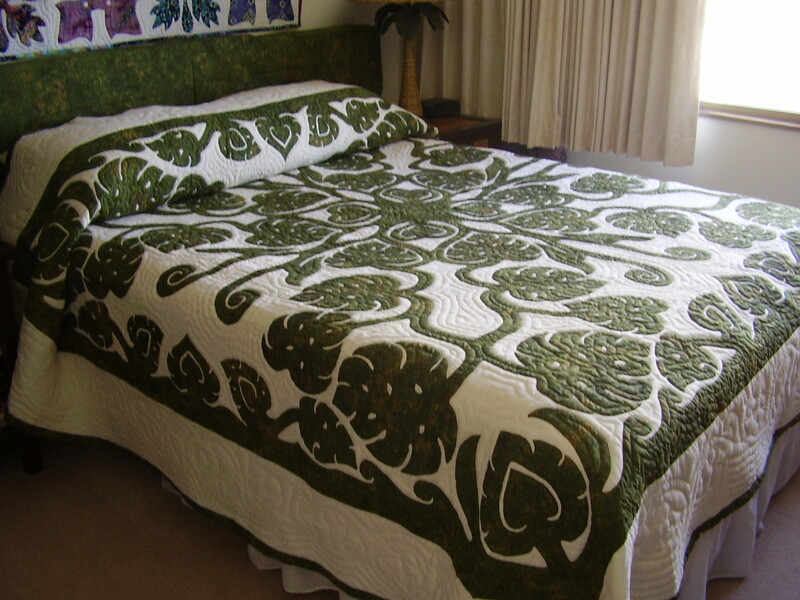 Hawaiian Quilts tell stories of love, memorable occasions , favorite places and even hopes and dreams for the future but it’s the Hawaiian Comfort Quilt that truly symbolize the true meaning of living Hawaiian. 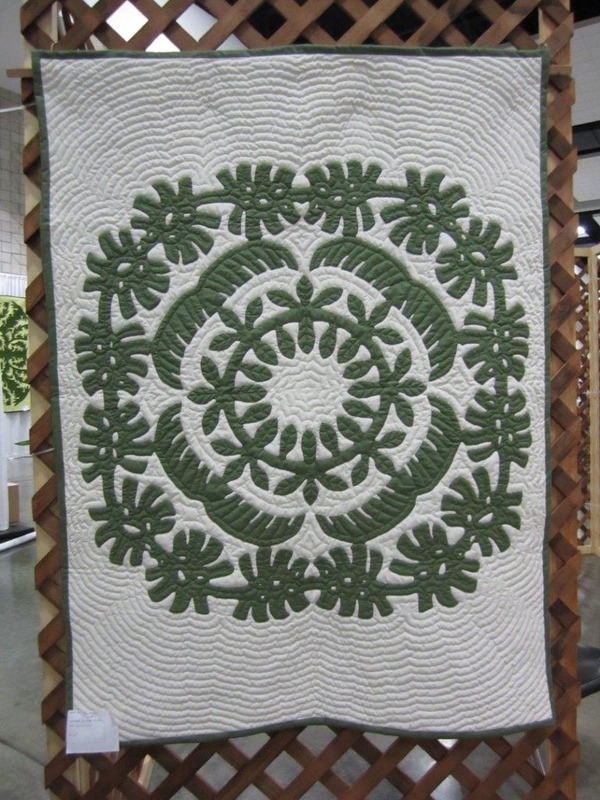 Everyone knows that Hawaiian Quilts cannot heal but it truly can bring comfort to those who are experiencing health concerns. 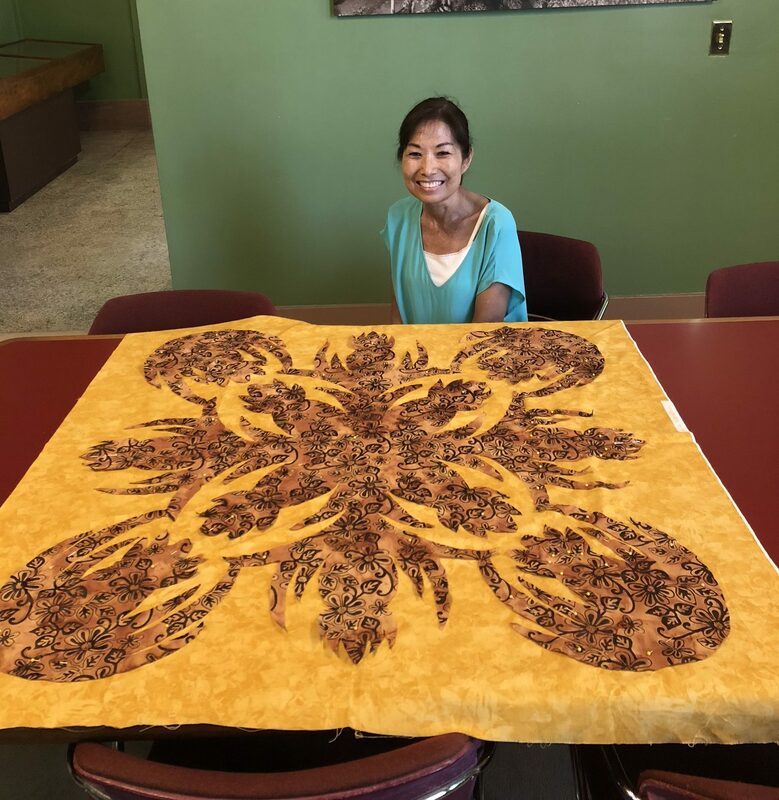 This Awa Quilt was designed by Kumu Nobuko Nakagawa and quilted by her student Reiko Takeuhi for our amazing Quilt Designer John who’s having a few health concerns these past months. 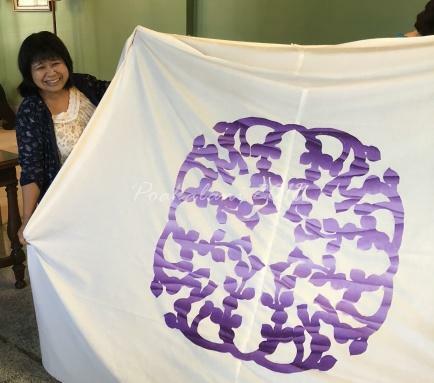 Thank you Nobuko and Reiko for bringing comfort to John. He looks good and feels amazing. Dolphins found on beach in Italy. 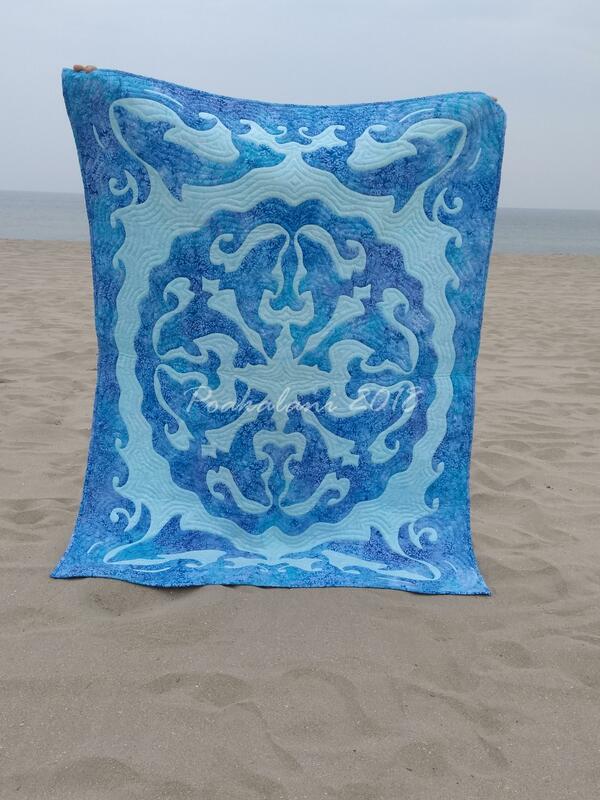 Design First, News & Updates, Quilters Comments Off on Dolphins found on beach in Italy.